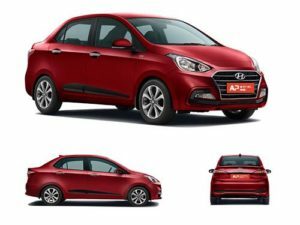 Introducing a mid-cycle update for the subcompact sedan, Hyundai India has launched the 2017 Hyundai Xcent facelift in the country with prices starting at Rs 5.38 lakh (ex-showroom, Delhi). 2017 Xcent gets a comprehensively reworked front design. The overall silhouette remains the same, but the grille is all-new and in-line with Hyundai’s bigger sedans while the headlamps have been re-profiled and get new black inserts as well. The front bumper has also been redesigned adding a fresh look and now gets boomerang-shaped LED DRLs as part of the changes. Not only does the Xcent look fresh, but also distinctly different from the Grand i10. The side remains the same, save for the revised alloy wheels, while the rear gets the more upmarket wide taillights, revised bumper and tweaks to the boot-lid. Hyundai Xcent On road price starts from 5,43,574/-. Check for price details of Xcent in CarzPrice.